If the mandarins at the Treasury were asked to come up with a levy to penalise a region most severely, they couldn’t have done any better than the blunt instrument that is Air Passenger Duty or APD. Of all the regions of the United Kingdom, APD has a more harmful and profound effect in Northern Ireland simply because we’re right next door to the Republic of Ireland, where a similar duty was ditched after politicians saw the damage it was causing the economy. Belfast International Airport is the principal airport in Northern Ireland and, yes, growth has been impressive in spite of APD. We will see 2016 passenger numbers easily exceed five million. In 2017, we will set a new record. We’re not doing badly at all; but it is but a fraction of what we could achieve if we weren’t saddled with the tax. In short, Belfast International is losing business to Dublin Airport. Dublin is in expanding mode, and has proudly claimed that 1.2 million passenger journeys originated in Northern Ireland in 2015, which is up 37% on the previous year. The loss of 1.2 million journeys is the equivalent of losing more than 1,000 on-site and supply jobs in the sector. That is the extent of what is being lost to Northern Ireland, which is re-building its economy after colossal industrial decline and a generation of civil unrest. No tax means lower fares. That, in Dublin’s case, fuels demand and stimulates existing airlines to expand, and encourages new carriers into the market. No tax, along with an administration that understands the economic importance of airports, has produced quite remarkable growth in recent years. Only two of the Top Ten routes favoured by Northern Ireland passengers using Dublin were long haul (JFK and Dubai). Airline pricing and zero APD are, therefore, significant factors in Dublin’s popularity. Price is the determining factor on GB and mainland European routes. Bluntly, fly short-haul from Northern Ireland, and the tax ‘take’ is £13 one-way or £104 on return fares for a family of four. In the Republic of Ireland, the tax is zero. Improved road links and an open land border mean passengers are willing to endure a two-hour drive from Belfast to Dublin because of the accrued saving. APD is making Northern Ireland airports less competitive. All airlines operating on Belfast domestic and mainland European routes bemoan what effectively is a double tax. It is a lazy tax, charged without regard to the disadvantage that it causes, or the competitive edge it gives a voracious airport such as Dublin in a neighbouring jurisdiction. 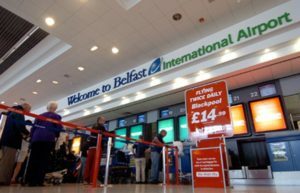 Airlines are keen to deliver expanded networks from Belfast International to major European cities, but are deterred by APD. One striking example of this is Ryanair. The airline is on record as saying it could serve forty new European destinations, and boost passenger numbers to 4 million, if the Government didn’t impose APD. For a long time, we’ve been pretty much a lone voice on APD, but thanks to Scotland and airports in the north of England, pressure is mounting on the Government to take steps to address this regressive tax. Increasingly, there’s evidence that politicians in the devolved institutions are anxious to see national Government address this significant disincentive. Scotland has gone one better by saying it wants the tax devolved from London, and then it would cut it by half in the first instance before doing away with it altogether. APD damages tourism and hampers growth in a sector where the opportunity exists to stimulate multi-million pound private sector investments and the creation of thousands of new jobs. Belfast International Airport would like to see the regressive tax scrapped to eliminate regional disparity and disadvantage. A Statement of Intent from the Government, giving full recognition to our unique position competing with a neighbouring State that has no such tax, would be a first step, followed by a Timetable to consign APD to the history books. APD is not a fair tax. It’s a crude instrument which benefits the tax collectors but does nothing whatsoever to aid Northern Ireland in its attempts to climb out of the economic doldrums.